As an example a shunt resistor is used with a resistance of 1 mOhm. The resistor is placed in a circuit, and a voltage drop of 30 millivolts is measured across the resistor. This means that the current is equal to the voltage divided over the resistance, or: I = V / R = 0.030 / 0.001 = 30 A. The same calculation could be made, but now with the resistance value unknown and the voltage and current known. This is used to calibrate shunt resistance. What is a shunt in electronics? 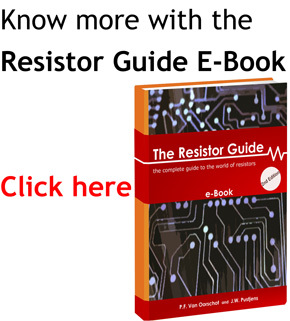 In this article is focused on shunt resistors, with the primary purpose to measure current. However, the meaning of the term shunt in electronics is broader than that. A shunt is an element that is used in a circuit to redirect current around another part. The areas of application vary widely. For some applications, electrical devices other than resistors can be used. A few examples are given to illustrate the diversity of shunts. A method to protect a circuit from a too high voltage is using a crowbar circuit. When the voltage gets too high, a device will short circuit. This results in the current flowing parallel to the circuit. This causes immediately a voltage drop in the circuit. The high current through the shunt should trigger a circuit breaker or a fuse. When one element in a series circuit fails, it will break the complete circuit. A shunt can be used to overcome this problem. The higher voltage that exists due to the failure will cause the shunt to short out. The electricity will pass around the defective element. A good example of this is Christmas lighting. Shunts with a capacitor are sometimes applied in circuits where high-frequency noise is a problem. Before the undesired signal reaches the circuit elements, the capacitor redirect the noise to the ground. 1. Before connection the ohmmeter leads, turn off the power in the circuit. 2. When connecting the leads to a DC current or voltage, make sure the plus and minus are chosen correctly. 4. Is the range of the meter high enough for the test circuit? 5a. If measuring current or voltage, turn on power and inspect the meter value. 5b. Don’t switch on power if you are measuring resistance. 6. Switch off the power and then remove the test leads from the circuit. 7. In case you measured current, reconnect the circuit as appropriate.